Conditions were perfect for the stunning phenomenon called firefall at Yosemite. 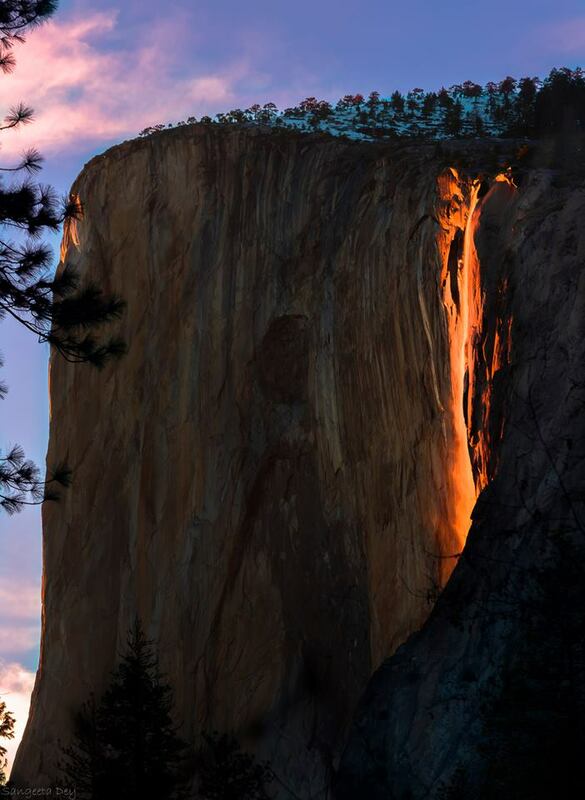 In a stunning phenomenon, Horsetail Fall in Yosemite only looks as if it is on fire or flowing lava down the cliffs on the shoulder of El Capitan. The popular illusion occurs only in February and conditions must be just right—setting sun, flowing waterfall, clear skies—or the Yosemite firefall, as it is referred to, could be a dud. For several photographers, however, conditions have been favorable this month as evidenced by the striking photos by Instagram user Shank0205 and Sangeeta Day. “It’s the way the sun happens to hit that causes the waterfall to glow in such a way,” Yosemite National Park ranger Ashley Mayer told CNN. For Day, she realized how lucky she was to be there when conditions were perfect and to capture the firefall in full bloom. “I’ve met photographers who said that they have been coming for 11 years only to see this happen two or three times,” Day wrote on Facebook. “The phenomenon was supposed to happen at around 5:30 in the evening, but I was there at 2 p.m. to find a spot. I finally settled for a tiny space under a thorny bush. When the fall started glowing, I couldn't believe what I was seeing. Sangeeta Day took this image of Yosemite firefall and posted it on Facebook. Day’s image of the Yosemite firefall was shared by Bay Area media and other outlets, but Shank0205 might have produced the best of the bunch. So when’s the best time to view this work of nature called Yosemite firefall? The Yosemite National Park website said middle-to-late February is optimal. I like to read about natural wonders even if it's not a wonder at all. It's so interesting how our nature act and show her attitude to human activity. I'm writing a blog https://resumescentre.com/write-my-resume about natural reactions. You can check it.